Nashville is a sports city. Ask anyone. Or just try to make it from East Nashville to downtown on a Titans game day, when the road is one single, unmoving, bumper-to-bumper slog. Or take stock of a Predators crowd, where even the most die-hard country fan will swap out their Stetson for a "SMASHVILLE" ballcap. But for those who can’t make it to the actual games, this city still has plenty to offer sports fans. Over the last few years, Nashville’s music and sports scenes have made peace and even found ways to work together, meaning you don’t have to pick between honky-tonks and catching the game anymore. Here are the best bars in Nashville to watch a game or two and knock back a few rounds. In many ways, Three Crow Bar is the true, beating heart of East Nashville’s Five Points neighborhood. Not only geographically, but also in spirit, as Three Crow features everything you could want out of an East Nashville bar. Plenty of screens to catch the game, a recently revamped food menu with lots of classic pub options made from local fare, an immense beer list and a relaxed vibe that lets you know you can stay as long as you want. Which, trust us, is gonna be a while. The Midtown neighborhood has long been one of Nashville’s surest bets for good food and drinks, and there’s no surer bet in Midtown than Tavern. Fourteen screens guarantee plenty of access to the game, and a constantly rotating menu of both small bites and big plates guarantees you’ll never get the same dining experience twice. But there are a few staples, like an energized atmosphere, an attentive staff and a beloved burger. A simple hack is to show up early for Tavern’s famous brunch menu and then just stick around till kickoff. M.L. Rose has a few locations (Melrose, Sylvan Park, and Capitol View) and they all have their own unique charms, but for game day, we’re partial to the Sylvan Park location on the west side of town, by virtue of its huge outdoor seating area stocked with giant Jenga blocks. M.L. 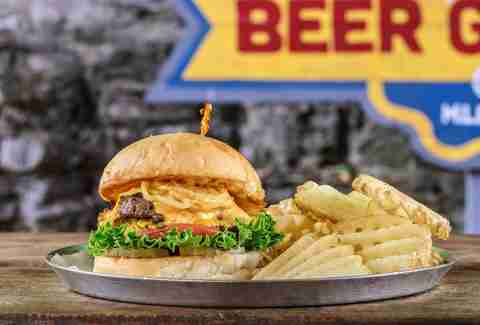 Rose’s burger is what put them on the map, but their 90-craft-beer selection is also one of the biggest in Music City. If the weather isn’t cooperating, consider the one in Melrose, where Jenga is swapped for arcade classics. East Nashville is generally thought of as a place people go to get away from the sports bar crowd, but there are a few interloping bars among all the speakeasies and clubs. 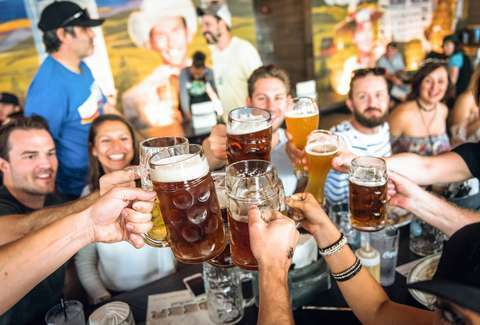 For watching sports, the best known is Beyond the Edge, which has 125 beers for you to choose from and plenty of food options (there’s something about those wings). They’ve also got two-for-one specials on beer on weekdays and other deals on selects beers after 7 every night except for Saturday, so they’ve got you covered no matter when the game starts, or how late overtime runs. 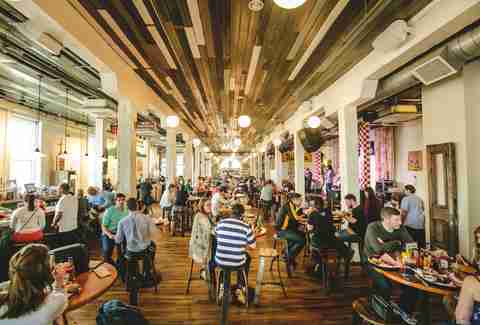 Acme Feed & Seed isn’t old, but it’s already hard to imagine the city without it. An immense, four-story complex overlooking the river set right on the edge of downtown, Acme’s got room for most everyone in town and something to offer them too. If you’re looking for sports, head for the second floor, which has the most screens of any level. If it’s nice out, head all the way up to the rooftop, which still has plenty of screens so you won’t miss a thing -- so long as you can peel your eyes off one of the best views in town. “Less is less,” or so it seems the chefs at Jonathan’s seven locations have decided. Check out their menu and just try not to get overwhelmed by the options, which range from standard sandwich and burger fare to pastas to flatbread pizzas to tacos and we haven’t even scratched the surface. There’s a warm familiarity to any Jonathan’s meal; you’ll feel like you’ve been there before on your first visit, and the food feels like something you couldn’t exactly make at home but that someone could. That makes all the difference. Daily drink specials? Check. Huge outdoor seating areas? Check. Something called a “mimosa bucket”? Check plus. Crow’s Nest is one of Green Hills’ better sports bar spots, with two levels and lots of outdoor seating that never puts you too far from any screen while still maintaining an easy, relaxed vibe (at least until the game gets heated). Oh, and those mimosa buckets? You can, and should, get one. They’re available Saturday and Sunday from 10am to close, and they’re as good as they sound. 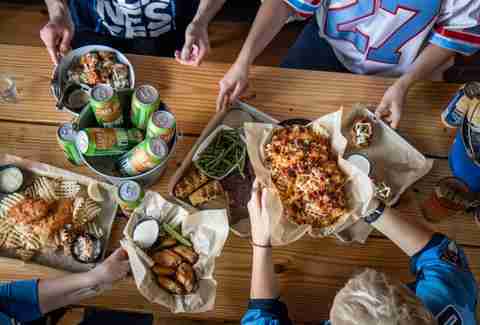 Double Dogs is a solid, family-friendly option in Sylvan Heights and Hillsboro Village, with plenty of screens and beer specials for fun, low-key game day hangs. The real plus to Double Dogs is the audio boxes at every booth that let you tune into whatever game you want so you won’t be fighting for the volume control with the other patrons, of whom there will be plenty. 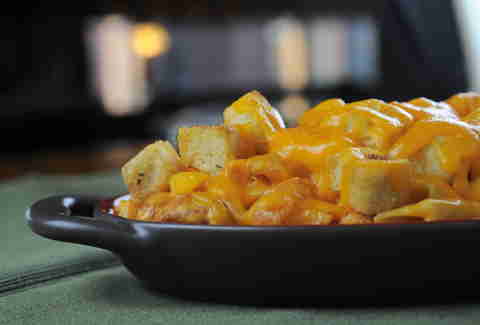 And while they’ve got 100 beers to pick from and plenty of food options, don’t sleep on their beloved buffalo mac & cheese, which, even in a town with tons of solid options for mac & cheese, still manages to stand out. There are bars where you watch sports, and then there are bars where sports seem integral to foundations, as if the place couldn’t exist without them. Dawghouse is one of the latter, a place where Nashville’s love of music and sports unites into a seamless and addictive vibe, from its chummy, friendly inside spots to its airy, energetic patio. There are plenty of solid food choices but we’re partial to the nachos and, maybe even better, those delectable fried pickles. The Kung Fu Saloon isn't much a sports bar as it is a “whatever you want us to be” bar -- but it's a great spot for both sports fans and their friends who might otherwise be enticed by Skee-Ball, any of the 20 arcade games, or maybe even the karaoke. And if none of that sounds appealing, just go for Kung Fu’s spin on Nashville hot chicken, a mouth-incinerating local obsession. Their take is quietly one of the best in town. If you’re headed downtown, you’re going to have to be prepared to duel with the city’s influx of tourists and bachelorette parties. Few places will reward you for the effort better than The George Jones -- nestled right in Music City’s hotbed of honky-tonks despite not quite being of them. The George Jones provides a great option for games and manages the trick of being a no-nonsense downtown sports bar while still offering plenty of fun, not unlike its famous and locally beloved namesake. Most sports bars cast a wide net, but Von Elrod’s prefers to excel in a couple specific areas: 36 beer taps, each one excellent in its own right, and the real star of the show -- the hand-cranked sausages. Von Elrod’s knows quality is more important than quantity, and every last crumb that comes out from their kitchen is mouth-wateringly excellent. Not into sausage? Not a problem. Go for the fried cheese curds, the deviled eggs, or their gorgeous, charcuterie plate-inspired snack boards. With food this delicious, the game may have a tough time competing for your attention. Tyler Huckabee is a contributor to Thrillist.